On 19 May 2019, Staffa Trio will perform Las bodas de Helena at the Sint-Antonius Abtkerk in Loo, The Netherlands. 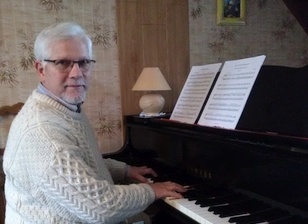 On 26 May 2019, the Virtuoses de Pornic will perfom my arrangement of Mozart's Rondo K. 382 for piano and sax quartet in Pornic, France. More information. On 28 May 2019 on BR-KLASSIK radio,Tristan im Mondschein will be broadcast during a one-hour interview of Susanne Kessel concerning her 250 piano pieces for Beethoven project. Read more. The Launching Concert for CD album HE has been postponed. Iwona Glinka and Vicky Stylianou will perform Romantica, a set of five pieces inspired by lyrical poems. On 20 January 2019, my arrangement of Leopold Kozeluch's Concerto for Keyboard 4 Hands was performed in Estonia. Watch the video of the second movement. CD album HE includes Romantica, a set of five pieces inspired by lyrical poems, recorded by flautist Iwona Glinka and pianist Vicky Stylianou. More information.